Dies R Us: You Are Awesome! Greetings Dies R Us friends. Happy Anzac Day! Today I've prepared a quick clean and simple card using some of my standard dies. Dies used are: Spellbinders Grand Circles & Spellbinders Label One. 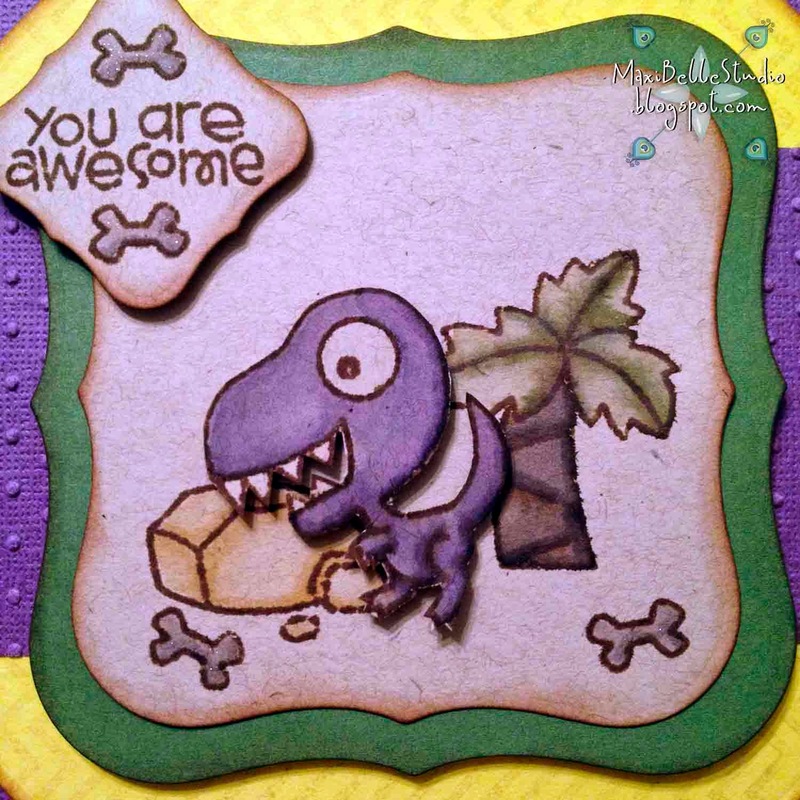 This cute little stamp set is 'Cutasaurus' and is from Papersmooches. I've stamped it with Gathered Twigs Distress Ink on Kraft stock and coloured in with Distress Markers. All layers have been edged with Vintage Photo Distress Ink. 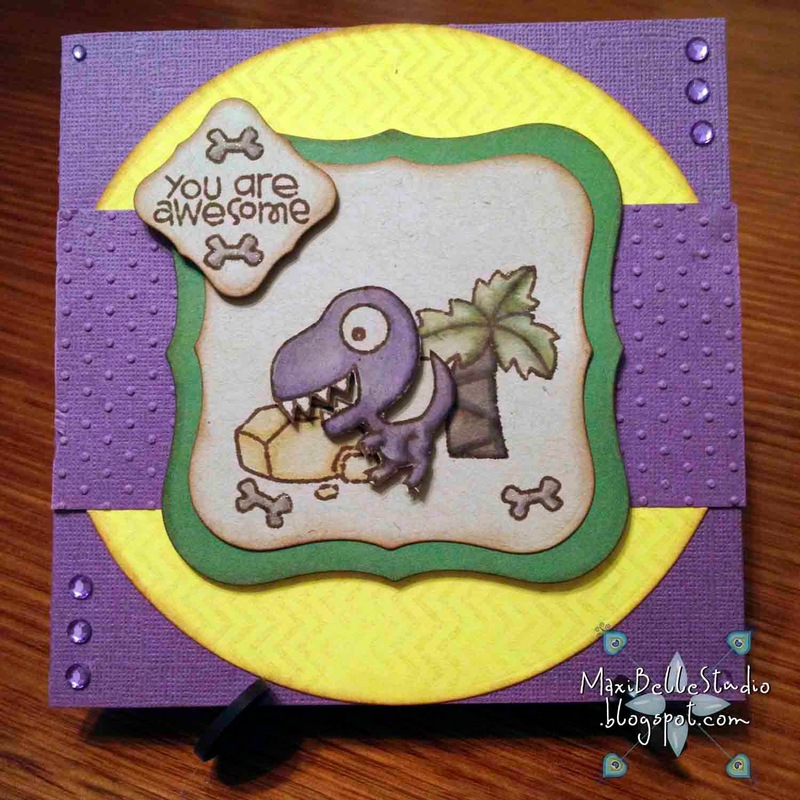 I've dry embossed a strip of purple cardstock and layered on a Spellbinders Grand Circle die cut and three different sized Spellbinders Label One dies. A splash of Wink of Stella and some purple rhinestones finish it off and your done! If you don't already know Dies R Us are starting a challenge blog! Please hop over to our brand new site which will commence on May 1. We are looking forward to sharing more creativity with you and are looking forward to seeing your creativity too! Thanks for stopping by and be sure to come back next Monday for another week of inspiration from the Dies R Us team. NOTE: April 25 was originally to honour the members of the Australian and New Zealand Army Corps (ANZAC) who fought at Gallipoli in World War 1. Anzac Day is a national day of remembrance that now commemorates all Australians and New Zealanders who served and died in all wars, conflicts, and peacekeeping operations. Today is the 99th anniversary of Gallipoli campaign. At the going down of the sun, and in the morning, we will remember them. Adorable card! Love the colors you chose too! Perfect for any little boy! And I loved the history lesson too! Now if I hear that phrase, I will know what it means! Day at the Park . . .
To Cut or Emboss? Why Not Do Both! Wedding Day . . .
Wishing you a fantastic day! Here a Snip, There a Snip!